Mehak Farrukh (left) and Charu Arya promote both World Mental Health Day and Minds Matter, a new student club, in the Campus Center. Across campus, students clad in lime-green T-shirts gave out ribbons, stickers and brochures, and in the Central King Building, an important discussion open to the NJIT community was held. 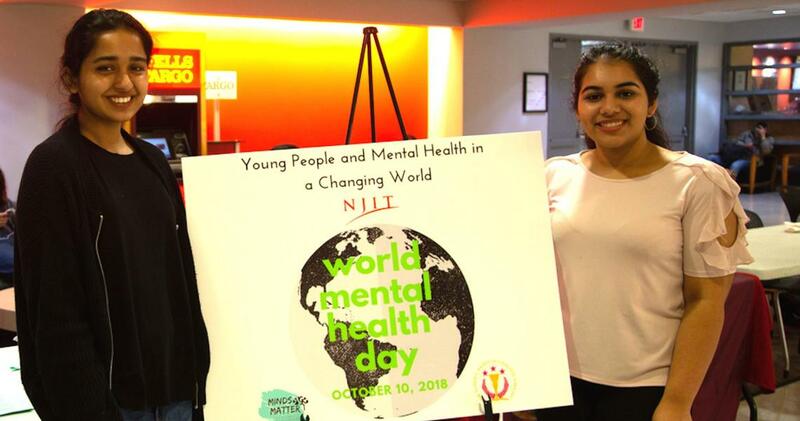 Both activities marked NJIT’s observance of World Mental Health Day, Oct. 10. They also represented the first public endeavor of Minds Matter, a new student organization at the university dedicated to raising awareness of and stopping the stigma surrounding mental health disorders. Minds Matter was joined in planning and carrying out the day’s events by the NJIT chapter of the National Society of Collegiate Scholars (NSCS) and the Knit and Crochet Club, with support from the Center for Counseling and Psychological Services (C-CAPS) and Albert Dorman Honors College. C-CAPS, located in Campbell Hall Room 205, is staffed by psychologists and professional counselors experienced in helping students manage the adjustment to campus life and the social and academic stresses that may arise during the college years. Services include psychological counseling, academic support and career counseling, cross-cultural/multicultural counseling and addiction counseling and referral. Additionally, students benefit from a confidential place to explore and examine issues regarding sexual orientation, and workshops on test anxiety, stress management, assertive communication and other topics. Phyllis Bolling, director of C-CAPS, is a licensed psychologist and serves as adviser to Minds Matter.